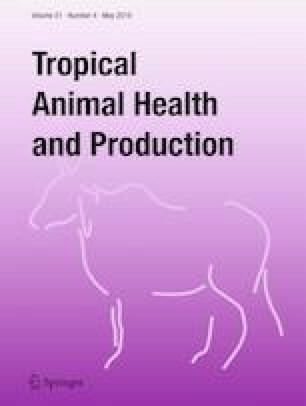 A cross-sectional study with simple random sampling approach was conducted from November 2017 to May 2018 with the objectives of estimating the prevalence of subclinical mastitis with its associated risk factors and to identify and isolate Staphylococcus aureus and Escherichia coli from mastitic milk in and around Gondar town, Ethiopia. The study was conducted on 334 lactating cows selected from 70 smallholder dairy farms. California mastitis test (CMT) and bacteriological culture methods were used as diagnostic tools. From 334 cows examined, 114 (34.1%) and from 1054 quarters examined, 238 (17.8%) were positive for subclinical mastitis using CMT test. Adult and old cows were 3.681 (95% CI = 1.541, 8.788) and 15.044 (95% CI = 3.051, 74.174) times more likely to have a chance of contracting mastitis than young cows respectively. Cow’s having 4–7 calving were 88.9% (OR = 0.111, 95% CI = 0.29, 0.423) less likely to have a chance of contracting mastitis than cows having ≤ 3 calving by keeping another factors constant. Mid-lactating cows were 63.4% (OR = 0.366, 95% CI = 0.150, 0.890) less likely to have a chance of contracting mastitis than cows in the early lactation stage. Crossbreed cows were also 79.1% (OR = 0.209, 95% CI = 0.046–0.948) less likely to have a chance of contracting mastitis than local breed cows. The odds of subclinical mastitis were 21.81 (95% CI = 4.618, 103.002) times higher in cows having tick infestation compared to cows without tick infestation and animals kept in good housing were 23% (OR = 0.73, 95% CI = 0.027, 0.197) less likely to have mastitis than cows kept in poor housing. The likelihood of mastitis occurrence was 3.372 (95% CI = 0.865, 13.141) times higher in cows managed in intensive farming system than semi-intensive farming system. Out of fifty CMT positive milk samples, proportion of Staphylococcus aureus and Escherichia coli was 17 (34%) and 8 (16%) respectively. As a conclusion, subclinical mastitis is the main important health constraints of dairy cows in the study area. Therefore, management, housing, and environmental sanitation should be improved.